BORN IN DUBLIN, Imelda May should be blessed with the luck of the Irish. And, given her extraordinary ability, this beautiful young lady shows all the promise of success with her new album, Love Tattoo, which has a mix of jazz-infused sounds hot enough to burst any thermometer. Imelda was given a one-in-a-million chance to perform two songs from Love Tattoo when she was a last-minute addition to the perennial music showcase Later… With Jools Holland. And what a treat for the audience: the magnificent Johnny Got A Boom Boom gave the audience a foot stomping riot of a song with a rip-roaring burst of hi-energy and lust for life that had crowds rocking across the UK. Imelda's second performance of the night demonstrated her vocal dexterity  a slow, tender and silken-voiced ballad Falling In Love With You Again, which she performed in a relaxed and easy way alongside Jools Holland himself on piano! Recent winner of Best Newcomer at the Irish Music Awards, Imelda has been touring this year with many luminaries, including Jools Holland and Van Morrison. She has also just finished an intensive summer festival season playing storming sets at Glastonbury, Innocent, Cornbury and Chiswick House. Imelda is, not surprisingly, also in high demand for private events. She has just finished an astonishing run of these bookings from St Moritz to Buckingham Palace, wowing crowds that included such esteemed company as Prince Charles, Prince Albert of Monaco and numerous Hollywood A-Listers. A sucker for the sweaty gig circuit, Imelda funds her recording and road tours by singing at these social occasions, earning her the tag of the Robin Hood of Rockabilly! With her incendiary live shows blazing a trail from pubs to palaces, Imelda's debut album Love Tattoo looks set to receive plaudits across the board. We especially liked Johnny Got A Boom Boom and this brilliant track reeks of the classic jazz foundations that so suit her gravely, seductive voice that is so beautifully exposed as she sings a cappella on the track Knock 1 2 3. 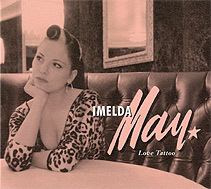  Imelda May's album, Love Tattoo, was released by Ambassador Records on 24 November (2008).